Explore the structure and organization of this trail. Explain who Peter Drucker was and his philosophy of management. We at Salesforce and Drucker-Ito School of Management at Claremont Graduate University are excited to collaborate on this management trail! We share a strong commitment to creating successful customer-driven companies, and we recognize the critical role Salesforce administrators play in ensuring this success. For us, it’s a perfect match of a great customer-driven software enterprise and a management school based on the cornerstone idea that the purpose of an organization is to create and keep a customer. The trail content draws from the MBA course curriculum at the Drucker School of Management—a school named after the school’s legendary management theorist and consultant, Peter F. Drucker. The module topics were chosen based on input we received from administrators through surveys and informal focus groups. In each module, we examine time-tested management principles, anchor them with real-world examples across industries, directly link them to the role of the administrator, and show how Salesforce solutions can help (Figure 1). Each module starts with a unit exploring organizational management principles embraced by high performing management teams. As an admin, developing a deep understanding of these principles puts you in a position to succeed when opportunities arise to contribute to your organization’s success. We realize you may not be the CEO (yet! ), but believe that knowing key management concepts can equip you with tools to prepare you to make a strong contribution, whether that is today, tomorrow, or the day after! In each module, we do provide a “Top 5 Things Salesforce Admins Can Do” to get you thinking in that direction. 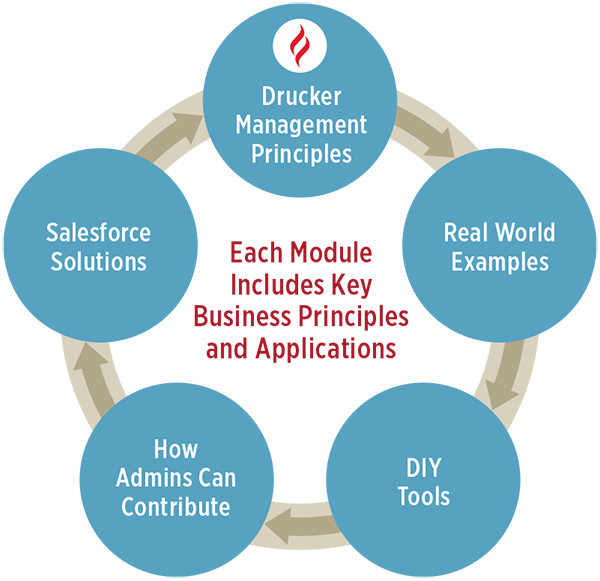 Also, feel free to join our Drucker School Management Essentials user group on the Salesforce Trailblazer Community! Throughout the course of this trail, you occasionally see the term “we.” So we thought it would be a good idea to introduce ourselves. The Drucker School of Management consistently ranks in the top 100 business schools in the United States. It’s located at Claremont Graduate University in sunny Claremont, California—also known as the City of Trees and PhDs—about 30 miles east of downtown Los Angeles. We are a member of the Claremont Colleges, which includes the ranked schools of Pomona College, Scripps College, Claremont McKenna College, Harvey Mudd College, and Pitzer College. Visit us sometime! Now that you’ve met us, let us introduce Peter F. Drucker, widely considered to be the inventor of modern management. As a writer, teacher, management consultant, and business visionary, he crossed many boundaries. He wrote 40 books (don’t worry, you don’t have to read them) and advised many top business, governmental, and nonprofit leaders. As you can probably tell from these quotes, the Drucker philosophy focuses on management as a human enterprise, with an emphasis on being customer- and market-driven, and taking a deliberate approach to achieving the right objectives for the organization. Drucker noted that “management … is a practice.” It can be learned and mastered. Understanding effective management is worthwhile because it helps us become better contributors at work. It empowers us to become better managers as well—all of which yields better business performance and more successful careers. It’s a win-win!